That’s tiger-striped walnut you’re looking at. 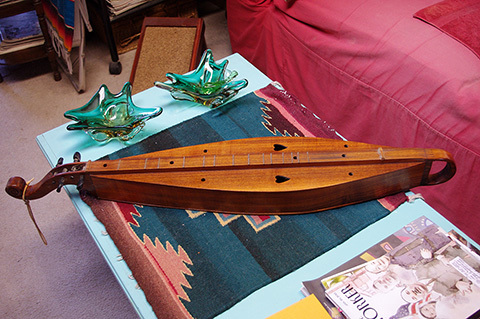 Audrey Y. H. Miller of Mouth of Wilson, Virginia made this Scottish dulcimer for me back in ’76 or thereabouts. It’s a replica of one a member of her family found hidden in the ceiling of an old log cabin, ancient as they get in that part of southwest Virginia, almost all the way to Tennessee. The original instrument had a mouse nest in it with several tiny skeletons. This was in my metal sculpture days in Maryland. 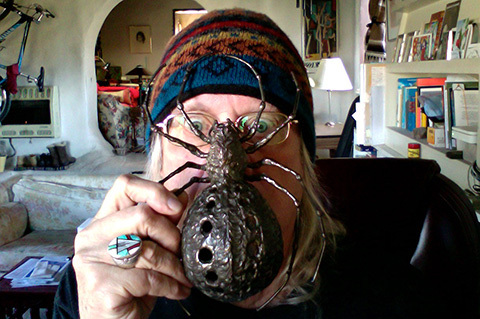 Self-taught and uncredentialed in the world of art, I pretended to support myself by selling mostly welded steel insects at any arts and craft show that would have me. I would travel to these places in my ’67 Saab V-4 pulling a home-made plywood trailer I’d bought from a crazy cedar chopper in the hills outside of Austin several years before. (Now don’t go and make me tell you what a “cedar chopper” is, because we don’t have time.) It was like a long white box box with little windows set on wheels—not itty-bitty trailer wheels, but real ones hanging on an axle from an old dead Ford. If I packed it right, there’d still be room to crawl inside and sleep. Anyway, I had a beautiful mosquito, a moth, a giant spider, a scorpion, an ant’s head you could stick a candle in, things like that. A sheet metal bat and welded mice provided contrast. The larger arthropods were up to two feet long and very accurate, as well as being nifty sculptures in the first place. I still have the spider, and I’m glad. No one wanted to buy these things, at least not where I was hanging out. Not until I hit the big time at a show in Blacksburg, Virginia, home of Virginia Tech, where two Entomology Department professors relieved me of the mosquito and the scorpion. I think I made $200 on the sales. What with sleeping free inside my trailer, I felt like I was rich. I was also having quite the sentimental weirding out because my family lived in Blacksburg back when Tech was V.P.I. and I was nine years old. I’d driven by the house we used to live in, locating it entirely by memory of the lay of the land, I swear, and naturally I couldn’t believe how small and plain it was. The juxtaposition of these two disparate forces fairly well unhinged me, and there was also the backwoods woodcarver I’d met the day before as everyone was setting up. An uneducated son of the hollers, he told me how he’d been a no-good drunkard and outlaw before turning everything over to God and learning to carve these little wooden birds. There wasn’t an ounce of scripture-quoting in him, either. I believed him because he was happy, never mentioned Jesus, did damned fine work, and looked like someone who knew his way around a jail. I also met a lady who was selling dulcimers. These weren’t just any dulcimers, but big ones like I’d never seen, gleaming beauties every one. The instrument I liked the best was made of what she called “tiger-striped walnut.” It was deeper than most, almost three inches for a fine rich tone, with a sturdy handle sort of thing down at the bottom and a long hand-carved tailpiece. Best of all, it made a sound like all the deep green misty mountains of the world. She played “Go Tell Aunt Rhody” on it, and I was hooked. Unfortunately, it was spoken for, but she said she’d make another if I didn’t mind the wait. By this time she’d filled me in about the walnut, the old log cabin, and the teeny-tiny skeletons, so I gave her $120 and my address before I hit the road. Finding Mouth of Wilson in the first place was an accomplishment. That an acceptable motel existed was a welcome find and not the only one. I’d left early and arrived about mid-afternoon. Once I had my room, I called Audrey, got directions to the house, and headed out. It was nestled way down in a holler—obviously—a large and rustic place, and there were lots of people there, which I did not expect and had no inkling of. It turned out that the day of my arrival coincided with a regular gathering where everyone brought food, played dulcimers, guitars, and fiddles, and had a high old time. I got fed and introduced to one and all and met the dogs, after which we sat around and played “Go Tell Aunt Rhody” until the sun went down. My dulcimer was beautiful. Audrey even gave me a hand-sewn custom-fitted heavy fabric case, which I still have, of course. I played it off and on for years, along with my acoustic guitars, until a Gibson ES-335 12-string and a Fender Twin Reverb amp destroyed my will to live a normal life and ran away to join the circus with my soul. For the last decade+ in this old adobe on the hillside, a place as different from Mouth of Wilson, VA as you will ever see, the magnificent Scottish dulcimer has been hanging on the wall collecting dust and spiders. After I took the closeup photo yesterday, I remembered that there used to be a label inside the instrument and wondered if it was still there. It was, and that’s how I rediscovered Audrey’s name. I took the dulcimer down and cleaned it up. It’s still the same as when I bought it, except that years ago in Maryland, I let a local idiot convince me I could tune it far more easily if I paid him twenty dollars to replace the orginal heart-shaped tuning pegs with plain old fiddle pegs. For the record, that’s a crock, and I wish I’d kept them all. There’s one around here someplace still, a talisman of sorts, and I will have to find it. Handmade for John H. Farr Jr.
“No. 31” is clear enough, but I’m not sure what the first thing in the last line means. It looks like there should be a period. Perhaps it’s faded. Is the right way to read this that she’d made thirty-one dulcimers at that point, and sixteen of them were Scottish? Dreams don’t exist in or point to linear time, at any rate. The thing is in my hands again, and this is good. Oh, wow! Saw this comment just before I went to bed, which says a lot for your own hours. It couldn’t be the same Audrey, could it? But maybe if that initial “H” stands for Hash, and she was married at the time… We need to talk, I think, of this and other things. ¡Ajua! UPDATE: Just watched the video. Whitetop, VA is in the same county, so it might indeed be her! The “Hash” name is ringing a tiny little bell now. How in the world did you find that link? And the video – Michael’s link – topped it off. I think he found her, man. I’m stunned.